As the healthcare industry continues to change and evolve, many hospitals are trying to adapt in order to maintain or increase their profits. With the increase of health plans featuring high deductibles and increased pressure on reimbursement rates, many health systems and hospitals have begun looking for any way they can find to improve their collection rates so that they can bolster their finances within this new environment. Let’s take an in-depth look at 8 different ways for hospitals to improve their collection rates on small balance claims. Rural hospitals lose on accounts receivable due to a number of preventable reasons. It is important hospital personnel is trained in collecting payments and inputting information. No matter what the claim size, obtaining payments is key. 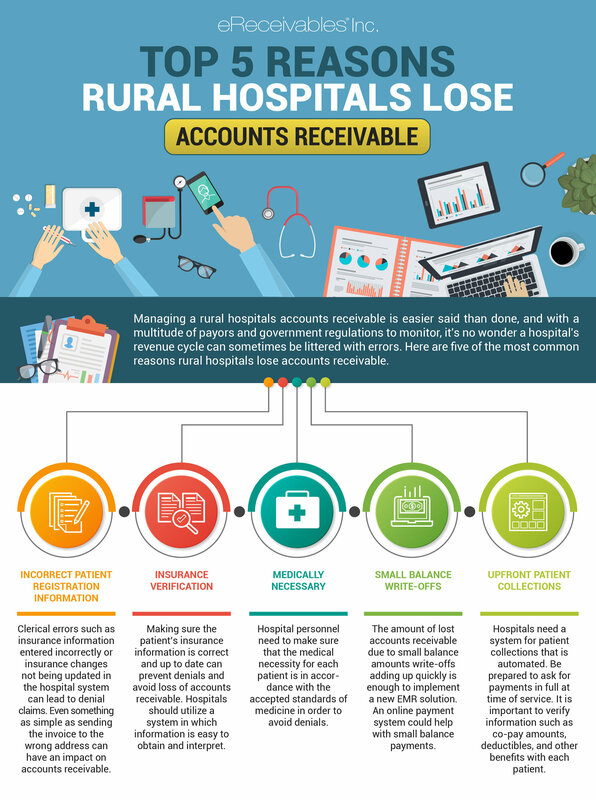 Use this infographic to learn the reasons rural hospitals are losing accounts receivable. According to Forbes, hospitals lose over $45 billion each year as a result of unpaid medical bills. Because of the heavy burden of denial management and a focus on collecting larger claims first, low balance claims often become overlooked. While it’s understandable that large claims tend to take precedence, hospitals should also consider how the successful appeals process for low balance claims can have a positive impact on accounts receivable (AR) management. Let’s assume that you have all of your ducks in a row when it comes to billing claims. You have assessed your procedures from the point of gathering patient demographics to the hiring of the most experienced coders. You’ve automated your workflow and implemented software to flag likely denials. You have done all that you can to expedite the claims process and streamline your accounts receivable (AR) management.